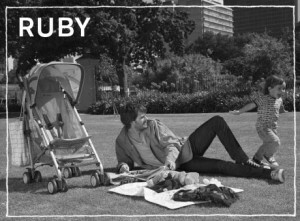 The Cybex Ruby stroller is a simple, lightweight (only 13 lbs!) and stylish stroller ideal for buzzing around town, weaving through the mall, or cruising across just about anywhere provided you’re on a smooth surface. It is designed for children 6 months and up, with a maximum weight limit of 55 lbs. With the optional car seat attachment, your newborn will be good to go as well, as long as he or she weights less than 55lbs. For first time dads like me who have very little experience with these types of things, and who prefer to not read instructions, the Ruby is very user friendly, so much so that I was able to assemble it and figure out how to fold and unfold it without too much head scratching and without once consulting the owner’s manual or my wife. Of course, after I finally did look over the manual (per my wife’s suggestion), I discovered some nice features. One of them is the two-position seat back feature. While it is a relatively minimal adjustment, it does offer a slightly more reclined position to promote precious nap time. Another feature is the adjustable 5 point safety harness, which has three positions to accommodate your growing child. The Super Canopy can be moved up and down as well, allowing plenty of headroom for even the tallest children. Aside from the up and down adjustment, the canopy ratchets between different settings for easy positioning. It also can expand for maximum coverage from the sun or rain. Other features include a shoulder strap, step-on/step-off brake activation with cable-linked rear brakes, and front wheel swivel locks, which come in handy if you happen to end up on a non-smooth surface, such as dirt roads or perhaps a sand bunker at your favorite golf course. The only feature that may be problematic for some folks are the non-adjustable handles which are fairly high. I’m a tall guy, so they are in a convenient position for me, but someone a bit less tall may desire a lower position.